PSA: at Blindscity, we now stock custom made curtains! You’re welcome. Curtains, Blinds & Awnings Thomastown›Blinds City›Articles›PSA: at Blindscity, we now stock custom made curtains! You’re welcome. Curtains are a stunning addition to any room that really helps a house feel like a home. As of March 2017, we will be supplying custom made curtains that are sure to the perfect fit to a home. To the nitty gritty, why would you choose curtains and what makes a curtain suitable to your home? Let’s find out! Curtains are an attractive window treatment option for a number of reasons. They are easy to install and operate, maximise your light and privacy control, and add to the energy efficiency of your home. Curtains are a popular window dressing addition to bedrooms, theatre rooms and alfresco doors. Curtains have a transformative effect on any given room, and can really help to tie elements of your decor together by complementing each piece. Curtains are also a practical solution in terms of improving the energy efficiency of your home. Your windows allow cool winter air and warm summer heat to come in. Adding in a window treatment means that your home is better insulated and energy efficient. Expect air conditioning and heating bills to drop! 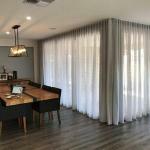 Blindscity curtains are available in two materials: sheers and blockouts. Each fabric has its advantages and is better suited for some rooms over others. At Blindscity we offer ready made or custom made curtains. Ready made curtains are an affordable option, but somewhat constrictive in terms of the range of colour and size available. For full freedom and customised size to your space, we have introduced custom-made wave-fold curtains. Choose from blockout fabric to maximise privacy, energy efficiency and light control, or opt for soft and elegant sheers. Each option offers different styling and functional features. Blockout curtains are great for bedrooms, completely blocking out the sun so that you can get a good night’s rest! Turn your window into a focal point by choosing contrasting colours to your wall colour and décor. Sheer curtains are an elegant and aesthetic option that will not give you much control over the amount of light coming into the room, but offer a degree of privacy. But, why not choose both? Or a combination including blinds?